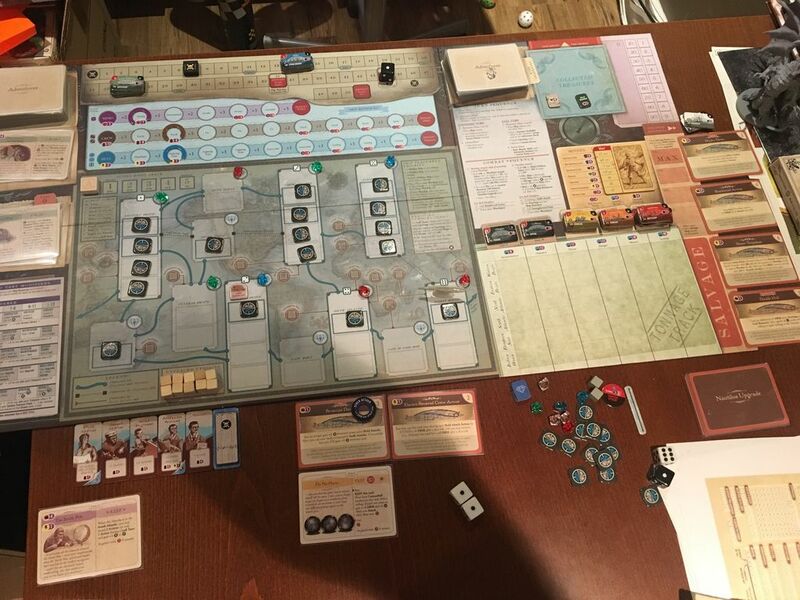 This is my fourth official Nemo's War session report. My aim is to make these session reports as detailed as possible. Each turn will be called a "week" in the Captain's Log. 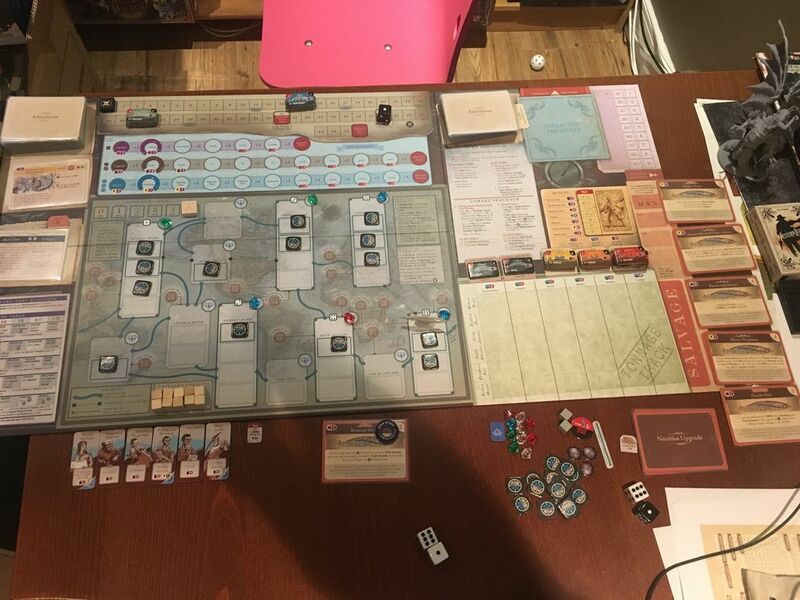 This is my 9th time playing through Nemo's War, and I'm steadily improving my play, though certainly exploring everything the game has to offer.. If you have corrections, recommendations or suggestions between parts of a journey, feel free to make them in the comments. I started playing using the recommended "Explorer" motive. 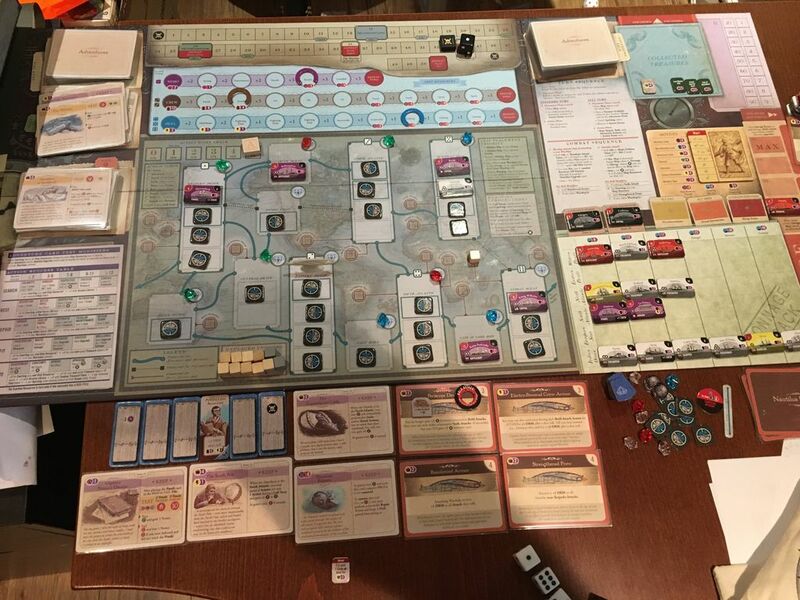 After my first few plays, I started these session reports, and my first two were the "Science" motive to start. The third was "Anti-Imperialism". For THIS session, I think I'll go with the motive I have the least experience with - "WAR!" We start with the "Periscope Device" upgrade. To pay for it, I'll dock one of each resource from its maximum position. The 4 random available upgrade cards are "Steam Torpedoes", "Hydro Drive", "Electro-Powered Crew Armor" and "Reinforced Armor". We will be playing without any expansions (neither Deadly Seas, nor Upgrades). We will play at the Officer difficulty level, which is the default game difficulty. I'll keep it here, since I started using this level in my last game and didn't do too badly. We won't be playing with "taking the blows", or any other optional rules. Scores will be calculated at the end. I might also tally it up at the end of each session break, if I feel like it. So, can Captain Nemo take the fight to the Imperialist powers by eliminating their naval capabilities? Let's find out! Our starting ocean is the Indian Ocean. Event phase: "Attack of the Giant Squid" (test 10) is our very first event this game. It's got a nice reward, and a terrible penalty for losing, so I'll risk both crew and hull. I roll 6(+5) and pass. The reward is two treasure tokens. First one is a retain token for +1 action. The second is a retain token to reveal an upgrade card. Well! Since I have no notoriety mitigation upgrade on the board, I'll spend that right away. The revealed upgrade is... "Double Hull". So no luck on the mitigation. Placement - W:1,6 Great roll. I place hidden ships in the Western Pacific and Indian Oceans. Action points increase from 1 to 6. 1) First action is a search. We risk a crew and roll 5(+3). Not as much of a pass as we wanted, but it will do. Notoriety increases to 1, and we draw a treasure token and it is … a 0 VP token - ouch. 2) We make a bold attack against a hidden ship. It is revealed to be the "Taitsing"(-,9). We risk a crew and roll 6(+3), sinking the ship and placing it in salvage. Notoriety increases to 2. 3) We stalk attack the other hidden ship. The "Napoleon III"(-,8) is revealed and it looks like easy pickings. We risk a crew and roll 3(+4). We're one off, but I don't think it's worth it to mitigate just yet. I'll take my lumps. A crew is lost and notoriety increases to 3. 4) Stalk attack against the "Napoleon III"(-,9) once again. Risk crew and this time roll 8(+4) and we put the ship in salvage. With action points resting at 1, we'll end the turn. Event phase: "The Grecian Archipelago" (play). Ouch. Notoriety goes up to 4 and the warship attack against the Nautilus rolls 6 (a 1,5), so we'll take one hit - a 6 which is Hull, taking it to "Fighting Trim". The card is placed in the pass pile. Placement - W:5,6 not as good as last turn! I place hidden ships in the European Seas, as well as the Indian Ocean. 1) Stalk attack a hidden ship. If I can salvage it, I'll be upgrading as soon as I can. We draw the maru "Britannia"(-,10) and we'll risk a crew to sink her. The roll is 11(+4) and down she goes. I place her in salvage and notoriety increases to 6. Event phase: "Do No Harm" (test 10). I really like these Cannonballs, and I'll risk a Nemo to get them. The roll result is 7(+2). the dice were 2 and 5. Is it worth Ned Land to get them and preserve 2 nemo points? Probably, I suppose, since this would put Nemo halfway down the track. Ned land is sacrificed (notoriety is now 7) and we pass. Placement - W:3,3 Lull turn. Two hidden ships are added to the North Atlantic. An available treasure is placed in the Arctic, as well as the Adventure deck. Action points remain at 1. 1) Hmm.. I think I'll go on an adventure to start. Might be worth the two treasures. I draw "The Treasure Fleet" This is awesome as it is one of the best cards in the game! 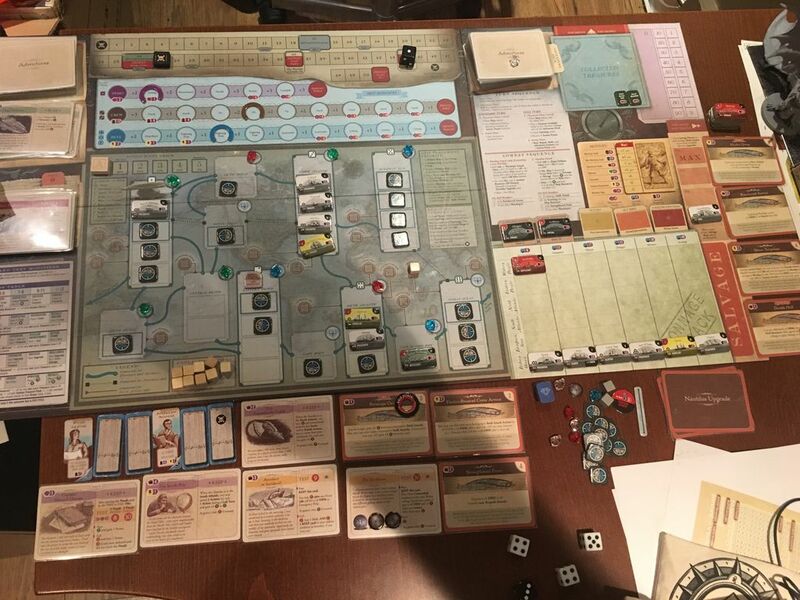 I roll the Eastern Pacific as the random location, and put the "Sunken Treasure Fleet" token there. 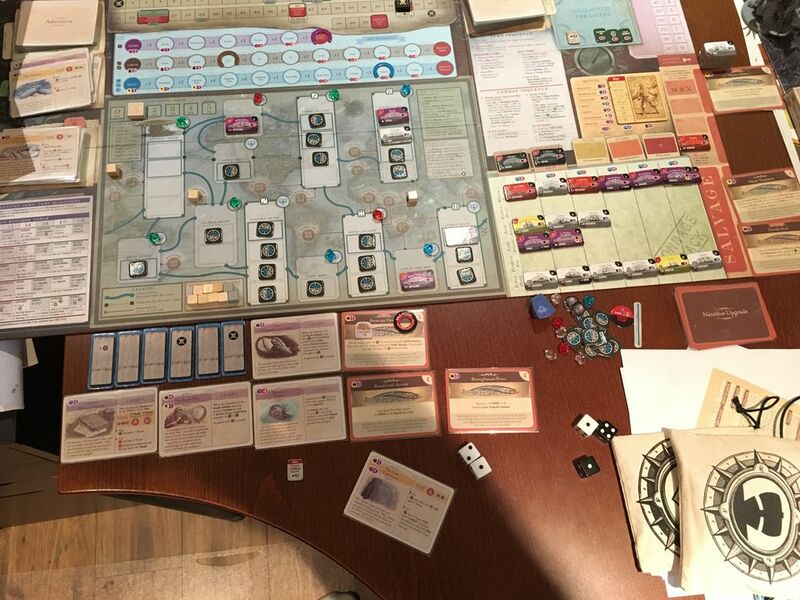 The treasure available token goes into the Central Pacific. Also, for passing the adventure, I get the two treasures that were on top. First one is a wonder - the "City of Khambhat". The second is a 2 VP token. 2) Refit. I'll risk a crew, and spend my 2 VP token. The roll is 6(+5) and I'm 1 short of my goal. I wanted to get Reinforced Hull, but I'll take the consolation prize - Electro-Powered Crew Armor. And it's late, so we'll call it here and carry on tomorrow. Should I continue this turn by sacrificing some actions and trying to raise my hull or crew resources? Or should I just continue with the next turn? Let me know what you think. FYI, each turn represents a fortnight, not a week. You wouldn't want the voyage to end after only half a year. To not cause continuity problems, during this playthrough (and the previous 3), the Nautilus is more hydrodynamic and is equipped with a twin screw prop (or a TARDIS)! So, Nemo gets around much faster. Event phase: "The South Pole" (keep). I'll really have to think about using that. It's worth 6 points for our current motive.. but is that worth expending 2 actions? Placement - W:1,1 Horrible. Our 2nd lull turn in a row, so we've got no actions left. I place hidden ships in the Western Pacific and Indian Oceans. A treasure available gemstone is placed in the Indian Ocean, and another on the adventure deck. Action points remain at zero. Free) Use up the Chief Engineer to add 2 actions to our pool. 2) Rest action. For this, we'll risk our Hull. The roll is 2 (great). I'm not feeling like going from +3 to +2 bonuses via crew, nor from +2 to +1 via hull. I really should "take this", but this will mean scrambling for awhile. I sacrifice Conseil for a reroll. We get 9(+2) and this will increase our Crew. Surprisingly tough turn! Hope we can escape the doldrums of the Indian Ocean next turn! Event phase: "Captain Nemo's Diaries" (keep). Not a big fan of this card, because it's hard to mitigate the roll. But it is what it is - hopefully we'll roll the hard Eight when the finale arrives. Placement - W:5,6 The bad placement dice continue! We'll place two more hidden ships in the Indian Ocean. We'll also increase the action points from 0 to 1. 1) Bold attack versus a hidden ship in the Indian Ocean. We reveal the freighter "Scotia"(-,10). We'll risk a crew and roll. We get a 7(+3) and sink her. She will be added to tonnage. Notoriety increases to 9. Free) Continue our bold attack against hidden ships. The next ship out of the bag is the slaver ship "Syria"(-,7). Should be easy pickings. We'll risk a crew and roll 3(+3). Luckily, we have our Electro-Powered crew to use and increase the dice by an additional +1. This brings us to a success. 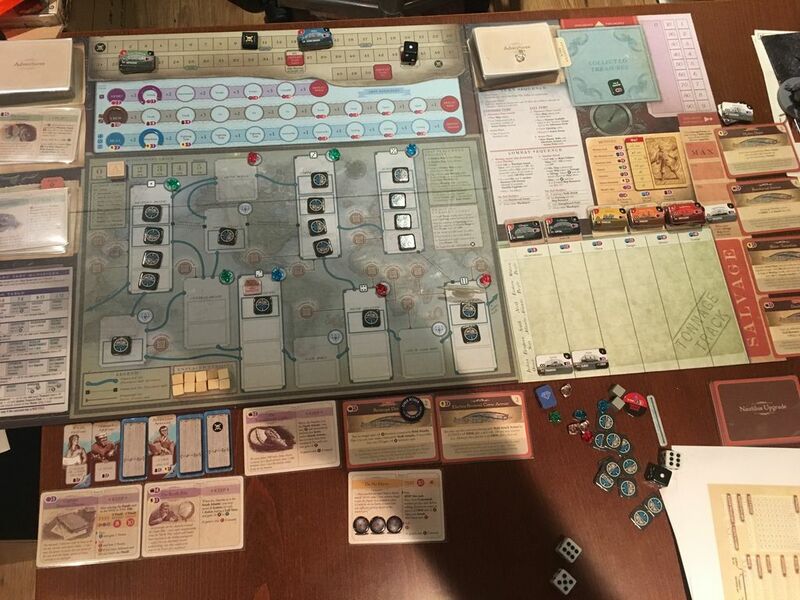 The Syria is sunk, added to tonnage, and we gain a crew. Free) Our bold attack continues. The last hidden ship is revealed to be the Agamemnon(-,8). Once again, we'll risk a crew and this time the roll is 10(+3). She's sunk and added to salvage this time. Notoriety increases to 10. Well, despite only having 1 action, that certainly felt like a more productive turn! Event phase: "The Transatlantic Cable" (keep). Free incite actions! I'm going to need them! Placement - W:5,6 Hmm.. I'm looking forward to Act 3 already... 2 hidden ships are placed in the Indian Ocean. Action points increase to 1. 1) Bold attack versus a hidden ship. We're up against the "Cutty Sark"(-,9). Maybe there's some Rum on that ship, eh? Risk a crew and roll 8(+3) for victory! We'll add her to the tonnage track. Notoriety goes to 11. Free) Continue our bold attack. This time it's yet another maru, the "Ellen Southard"(-10). Have we seen a warship yet? I don't think we have. 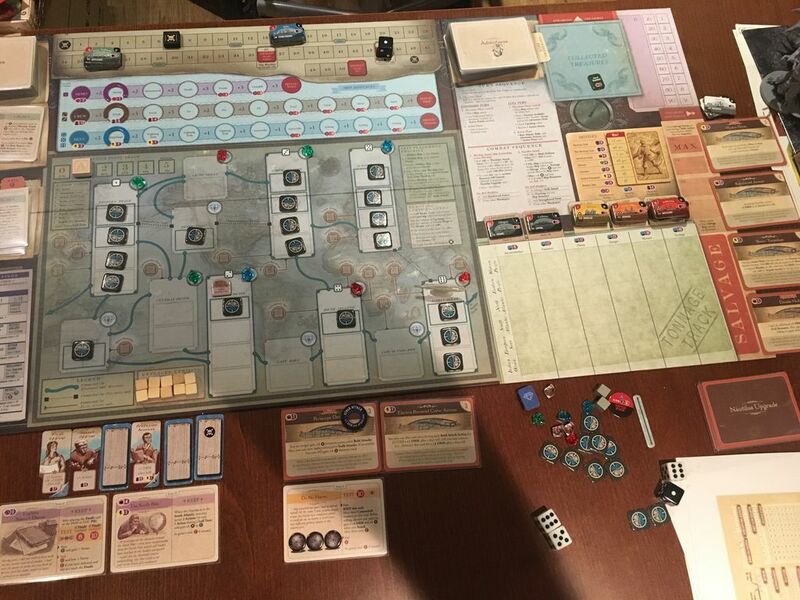 Anyways, risk a crew and roll 8(+3) and she is sunk and added to salvage. Notoriety increases to 13. I was going to keep tonight short, but I can't resist, since I know Act II starts next turn. 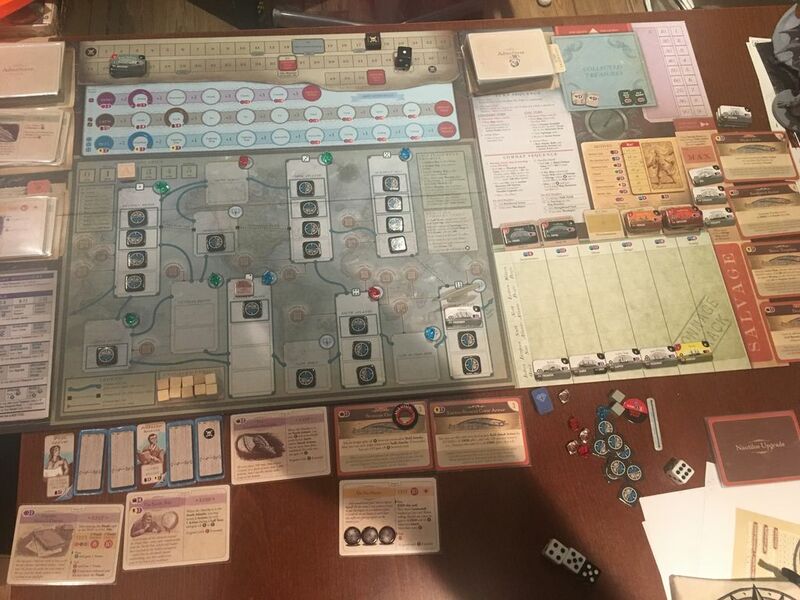 So, just like those long ago college nights with Sid Meyer's Civilization, I cry out "Just One More Turn!" Event phase: Act II (surprise!). We add the dark yellows to the ship bag, and a black dice to the placement dice. Now our real Event is "The Chinese Treasure Fleet" (play). Very nice card! Lucky I didn't move away yet. We add treasure available gems to the South Pacific, as well as to the Cape of Good Hope. And because we're lucky enough to be in the Indian Ocean, we pass this card and draw a treasure token. It's a Wonder - the "Great Barrier Reef". Placement - W:1,3 B:5 Well, can't complain about this roll after the last 4! Hidden ships added to the South Atlantic and 2 in the Indian Ocean. Action points increase from zero to 2. 1) Deja Vu? Bold attack against a hidden ship in the Indian Ocean. Another Maru - the "Star of India"(-,10). Risk a crew and we roll 10(+3). We'll add her to tonnage, but notoriety goes up to 16, forcing us to add the blue ships to the bag. Free) Continue the bold attack. Our new ship is... yet another Maru! Wow! "The City of Adelaide"(-,8) is about to be sent to Davy Jones' Locker. We risk a crew and 8(+3) makes it happen. We'll put this ship in salvage. 2) I think it's time to search. I really need a nice juicy VP token for when I refit again. But all I seem to draw are wonders! Anyways, we risk a crew on this search expedition and get 10(+3) and... I will stop complaining! Two treasure tokens from the bag. First one is 4 VP. Second one is 1 VP. Very much worth it I think. And that will end it for this evening. I'd like to fall into the "Just One More Turn" trap yet again, but the voice of reason says it is time to quit. These questions require a knowledge of your "grand" strategic vision -- there are many different ways to play War. Your Upgrades were not conducive to any of the "Hunt the Hunters" strategies, but seem well suited to wielding a "bold" scythe blade (adding Strengthened Prow Act III...conveniently quick for War). The reason War is the "swingiest" of the base game Motives, is that "Magnetic Mines" can massively increase War's efficiency. Spending many actions during a Lull to "pound" the Adventure deck can be very lucrative...or a waste of time. Even if the primary objective (MM) is "missed", a "Lull party" can develop based on additional actions gained within the turn and/or Treasure that can properly support "R" actions. But the -1 VP for "Adventures" can be dispiriting (as well as the Sci/Wonder ratings). What makes this an issue here is that there is a fair chance (about 1 in 3) that you won't see another Lull Act I/II, and there is less than a 50% chance you will see a Lull Act III (unless you manipulate one). You really could use a "crystal ball" here -- War used to profit heavily from becoming a "porcupine" full of Upgrades, but when those Mines were added to the game, "Reinforced Hull" and "Double-Hull" lost a lot of luster...if those cheaper (and better) Mines could be found. 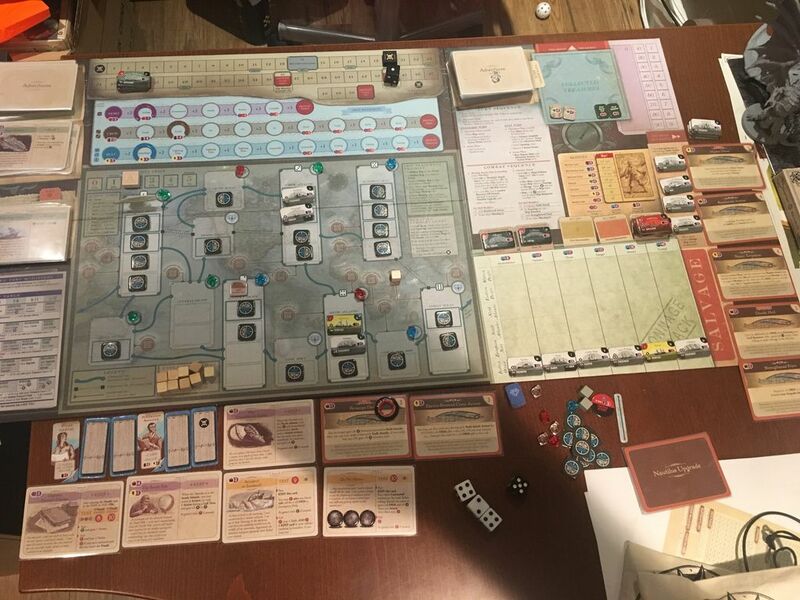 The "dice-luck" of Nemo has attracted a lot of attention, but the "card order luck" can be more influential in War play. Of course playing War without the Mines means absorbing very heavy damage...and efficiently keeping the "modifiers maxed" will always be a consideration. Despite the "hard" Motives sharing a "zeal" for filling the Tonnage Track, I find the cold, calculating, patient AI hunter, a very different breed then the hot-blooded, "do you feel lucky" War killing machine (though several unusual War lines of play exceed the AI in patience). I hadn't thought of pounding the adventure deck. But, like you're saying, that's a lot of action economy spent on the chance to draw a specific card. And if I calculate the odds, even with spending my officer corps, I'm not sure I like that approach, unless I'm going for a "long bomb". Event phase: "The Coral Realm" (test 10). Well, I don't need the 2 extra crew, so I'm not going to risk any. My roll is 6, so I fail this card and lose a crew as its effect. Placement - W:3,5 B:1 Hidden ships added to the South Atlantic and 2 in the Indian Ocean. Action points increase from zero to 2. 1) I'll hit more ships with a bold attack in the Indian Ocean again. First one is our first warship of the game. It's the Ironclad "Ryujo"(7,10). She'll attack first and she rolls 7 - no effect. For our attack, I'll risk a crew and roll 9(+3) and she is sunk. I'll add the Ryujo to tonnage. Notoriety goes up to 17. Free) continue our bold attack against another hidden ship. This one is the passenger ship "Chance"(-,10). Once again, I'll risk a crew. The roll is 3, and I'll take the consequences. 1 crew is lost, and notoriety increases to 18. I think I'll keep my last action point. If I get a lull, I'll use it to risk a refit, though I'm one salvage short. Event phase: "Aegri Somnia" (play)... of all the turns to keep back an action! Anyways, I'll lose my second officer to pass this. Can't say I'm happy about that. 1) Boldly attack the "Chance"(-,10). We'll risk a crew and roll 6(+3). We'll use the Electro-Powered Crew to add our missing point and we sink her and add her to tonnage. Notoriety increases to 20. Free) continue our bold attack and hit a hidden ship. This one is the mail ship "Thermopylae"(-,8) and we'll risk a crew against her as well. The roll is 8(+3) and we'll add her to salvage (better safe than sorry). 2) Notoriety is a little high, so I'll try to ease things up by going with an incite action. We'll spend our 1 VP token, and risk a crew. 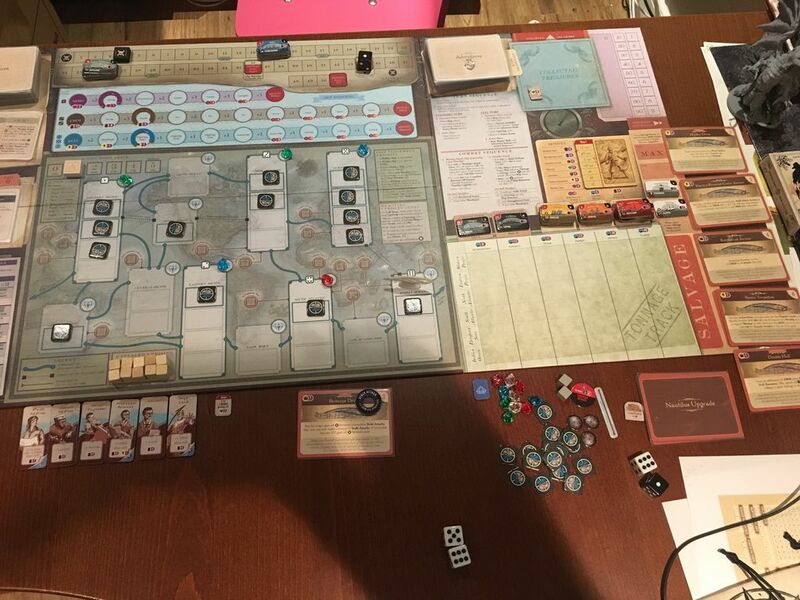 The result is 7(+4) and notoriety falls to 19, while an uprising token is added to the Indian Ocean. Event phase: Act Three (yeah!). We'll keep our motive the same, and select "Strengthened Prow" as our new available upgrade. We'll also happily add another white die to the placement rolls, as well as add the orange ships to the bag. Our next event card is "Accident or Incident?" (test 9) which is great if you pass it.. hurts pretty bad if you don't though. I'll go for it and risk a hull. The dice roll is 8(+2) and we get to keep this as a future DRM modifier. Placement - W:3,3,4 B:4 I thought more dice would mean more actions. I guess not! A hidden ship is added to the Arctic Ocean. The "Zeeland"(-,9) is drawn and added to the North Atlantic. A hidden ship is added to the Cape of Good Hope. The Ironclad "Huascar"(7,10) is added to the South Atlantic. Action points increase from zero to one. And that's it for this turn. Hopefully, next turn will be more dynamic. Event phase: "A Mass Execution" (play). I roll a d3 and get an extra 1 notoriety added, making it 20. Placement - W:2,4,4 B:5 Not much better, but I have places on the board that are becoming a real problem. Adding a hidden ship to the Eastern Pacific. The "Donau"(-,8) is added to the South Atlantic. The "Triumph"(-,8) is added to the North Atlantic. Finally, a hidden ship is added to the Indian Ocean. Action points increase from zero to 2. 1-2) I will refit the nautilus. There's still a bit of slack on the board, and I'll need that prow to hit as many ships in a turn as I plan to. I'll expend the 4 VP gem (oops! and noticed I hadn't removed the 1 VP I used earlier - corrected), and I'll risk a crew as well. The roll is 8(+7) and we get a Brilliance! I'll spend 3 salvage and grab Strengthened Prow as my upgrade. Event phase: "A Hollow Explosion" (play) - so soon! Okay. I will get to discard the "Zealous", the "Omaha", and the "Monarch" - all are (9,11). However, the ship I'm facing is the mighty Battleship "Invincible"(10,13). She rolls her attack first and the result is 7. The dice show 2 and 5, so I'll just take my lumps. The hits are 4,5, so both on the Hull, which decreases by 2. For our attack, I will use a Cannonball (increasing notoriety to 21). I will also risk a crew. 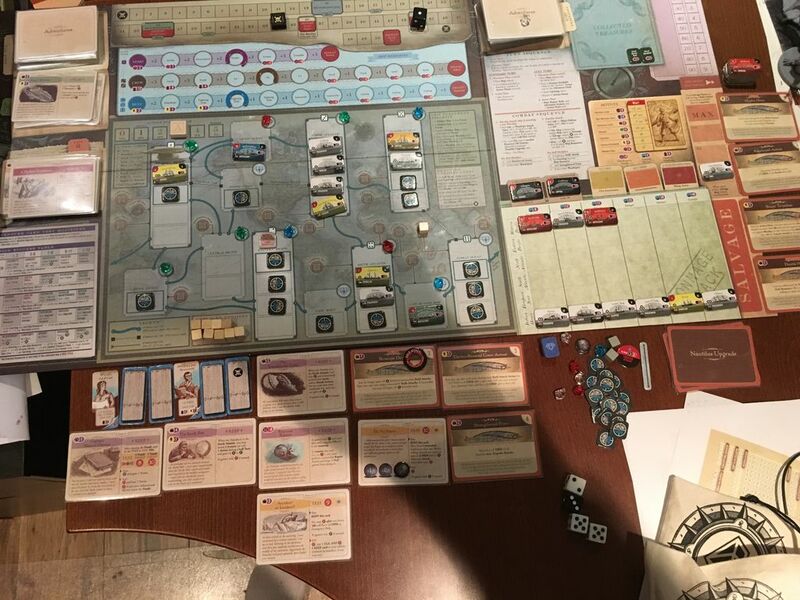 The roll is 9(+7) and the Invincible is added to tonnage (big VP haul!) while notoriety increases to 24. Free) Continue this free stalk attack against a hidden ship (action economy!). Notoriety increases to 25, and I draw the "Royal Adelaide"(-,10). I risk a crew and roll 2. Hmm.. I have no rerolls and I can't DRM myself out of the result, so... 2 crew are lost, and notoriety goes up to 27, putting the green ships into the bag. That didn't work out so well, did it? Placement - W:4,4,5 B:3 Okay, sometimes, the game is just out to get you. The "America"(-,10) is added to the North Atlantic. The Frigate "Abraham Lincoln" (6,9) is also added to the North Atlantic. The Battleship "Kniaz Pozharsky"(10,12) is added to the Cape of Good Hope. A hidden ship is added to the Indian Ocean. Action points increase from 0 to 1. 1) Bold attack versus the Royal Adelaide(-,10). Risk a Nemo - yup - a Nemo. Roll is 8(+3), and we add her to tonnage. Notoriety increases to 29. Free) A bold attack versus a hidden ship. It's (unfortunately), the Battleship "Audacious"(10,13). It rolls first against the Nautilus and achieves a 7 (dice are 1 and 6). I'll take the hit, which is a 1, moving Nemo to "Determined". We will return fire with a Cannonball, raising notoriety to 30, and also risk Nemo again. The roll is 8(+5), which is just enough to sink her. She goes to tonnage, and notoriety increases to 33. Free) Another bold attack versus a hidden ship. This time we get the Raider "Shenandoah"(8,9). It attacks first and gets 10 - a miss. For our attack, we'll risk a Nemo and we roll 3(+3). I'll just take the lumps. This loses a Nemo and notoriety increases to 34. And that's it for tonight. The Nautilus just can't seem to get the action it needs to do things like repair and rest, nor even get around to fix the oceans that are swelling with ships! It was a big risk to refit, but it had to be done. Hopefully, we'll be flush with actions next turn, otherwise, I may have to ditch Professor Aronnax to get the Nautilus moving! As usual, suggestions or commentary are welcome. If Nemo is "too sane", I almost always lose a Nemo when I draw Aegri Somnia -- the advantages of getting Nemo tuned "just right", have exceeded the risks in my experience. That said, playing War without any current "Nemo specific" mitigation, may be a good time to be conservative. And I may be getting too reckless in my zeal for massive scores...and too interested in flirting with defeat before achieving them. Sacrificing Upgrades in the endgame to avoid Nemo breaking has been a very handy tool, but not one that has "always worked". Other than Turn 1 (which was great, but you only can raise AP to 5 max), your Action Points generated have been awful. As I play with a personal "If it isn't a Triumph, it's a Failure" credo, I would have jump-started this torpid game with a "manipulated Lull" Turn 12. Icing the First and Second Officer (having taken a Nemo hit rather than killing the 2nd. Off. for Aegri Somnia), I would first hit the Adventure deck (hoping to find some useful Treasure/abilities) and then rejuvenate the crew with a full-power Nemo and (hopefully) Treasure support. It is certainly a risky move, but just hoping the dice will "turn" as relentlessly "good" now, as they have been so far relentlessly "bad" (for literally half the game), is I think a "longer shot". But that is a private style that is certainly not "obviously right". But the clock is ticking here in War, perhaps even "louder" than the threatened "suffocation" that imperils the "soft" Motives. Building the "ultimate weapon" is of small use if you don't get the chance to truly unleash it. As usual, thanks for the ideas, Wes. 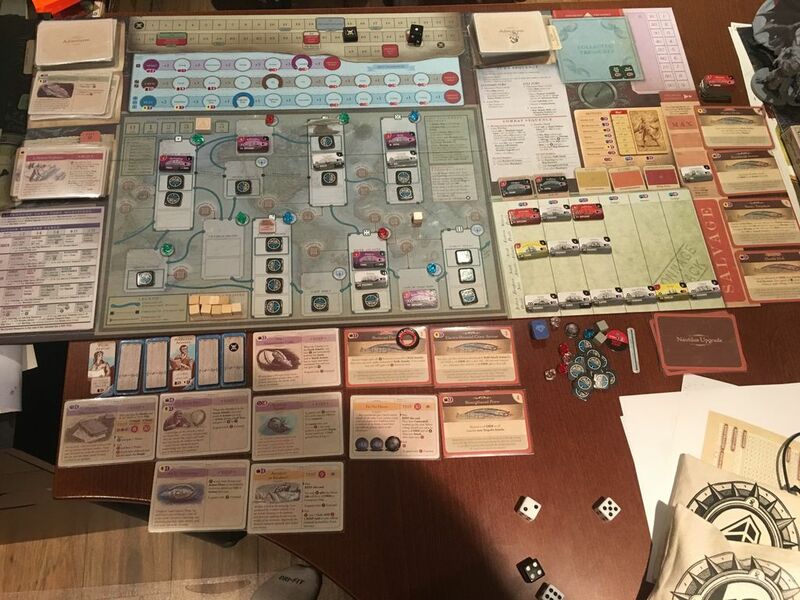 So far in Nemo's War, I like to play with the resources as close to the top as possible, including Nemo - or perhaps even especially. I get nervous when I risk Nemo at "Steady", particularly when I've got these Diaries as a keep card. If I risk Nemo and it goes down by 2 instead of 1, then the end of my game can boil down to a dice roll. Also, Nemo is the only resource I can't raise with actions. Instead I have to hit the search actions or get the right event/adventure cards. But yes, it's nice to have that +3 at the ready for any event test that comes your way, particularly if you've got top pluses in the other two as well. So basically, I like to play conservatively. But for this game, caution just isn't going to cut it! I'm going to have to play it loose and reckless - not for a higher score, but frankly, just to survive. Nemo's on the edge of insanity! And instead of risking crew (until I can raise it), I'll be risking Nemo for all these rolls. Event phase: "Required Repairs" (keep). No mercy from the event deck. Well, at least this won't kill me, it will just dock me points. I'm not sure I'll have the time to make these "required repairs". Placement - W:2,5,5 B:3 I suppose 3 action points is a reprieve compared to the last few turns. A hidden ship is added to the Eastern Pacific. The Battleship "Bellerophon"(10,12) is going to happily cruise solo in the Arctic Ocean for awhile. The Capital ship "Borda"(8,11) will be added to the European Seas, as will the mail ship "Tynwald"(-,9). Action points increase to 3. 1) I'd love to stick around the Western Pacific, or even grab the treasure fleet from the Eastern Pacific first, but the North Atlantic needs my attention urgently. If I can clear it, it will relieve a lot of pressure off the European Seas and the South Atlantic as well. Move to the Arctic Ocean. 3) Bold attack versus the "Abraham Lincoln"(6,9). She attacks us first and rolls 9, so we avoid being hit. We retaliate and risk a Nemo, rolling 10(+4). We add the ship to tonnage. Free) continue our bold attack against the "Zealand"(-,9). Risk a Nemo and roll 8(+4), adding her to tonnage as well. Notoriety increases to 35. Free) I'll continue the bold attack, this time against the "America"(-,10), risking the usual Nemo point. The roll is 8(+4) and we add her to tonnage as well. Unfortunately, notoriety has to increase, and it goes up to 38. 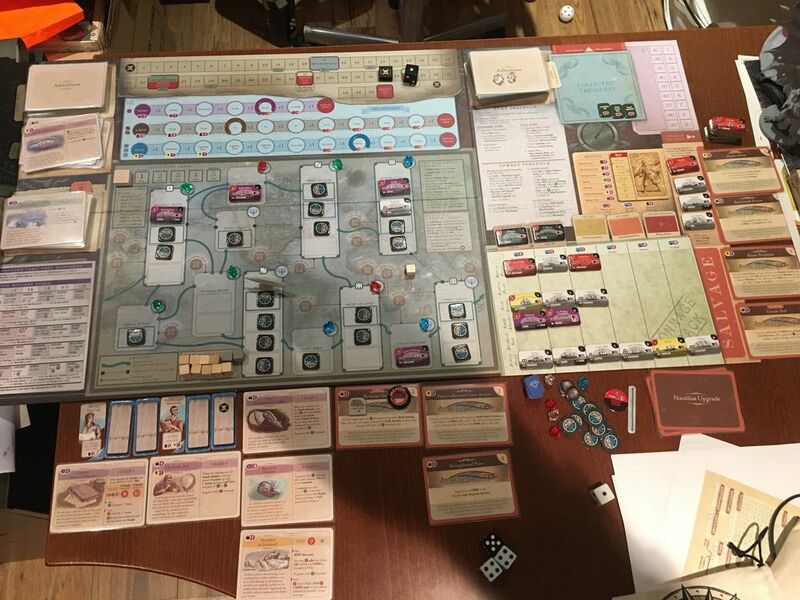 This means warships are now on their purple sides (Finally, I didn't forget this rule!). And wow, I thought they all got better when they did this, but I'm wrong! Some get worse, and turn to pirate ships. In fact, there are 2 out there that will give me crew! I can't wait to get there. Free) last continued bold attack against the "Triumph"(-,8). Risking a Nemo and we roll 2. This is very bad again, because I can't mitigate it. Nemo goes down to "Unstable", 1 away from defeat, and notoriety increases to 39. Event phase: "All by Electricity"(keep). Wow. I love this card, and it looks like I need it. Placement - W:2,5,6 B:4 Hidden ship added to the Eastern Pacific, as well as 2 in the North Atlantic, and one in the Western Pacific. Action points increase to 4. 1) Sneak attack versus the Triumph again. 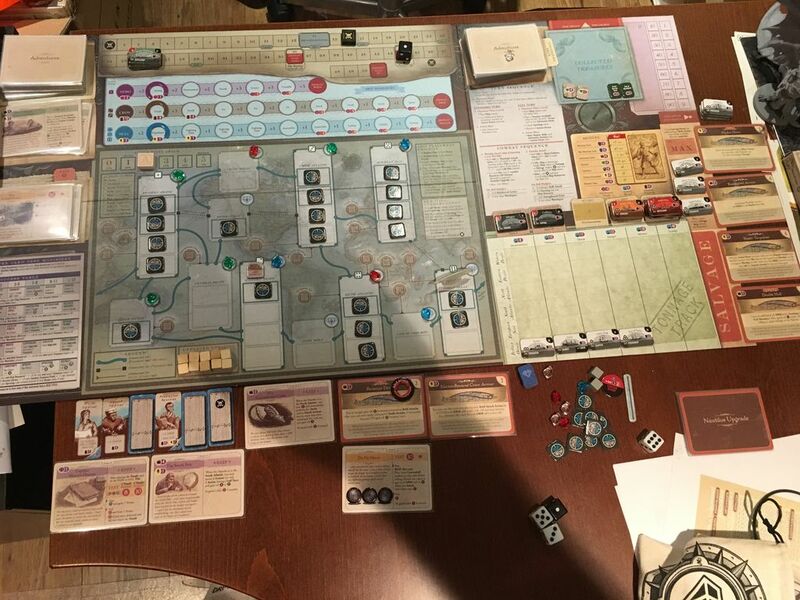 Risk a crew and roll 9(+3) and we successfully sink her, adding her to salvage. We also get a treasure token, which ends up being a retain token to GAIN A NEMO! How timely and fortuitous! Notoriety goes up to 40. Free) Let's use that Gain a Nemo token right away, shall we? Nemo is now at "Erratic". 3) Bold attack against the newly purple pirate "Huascar"(6,8). She tries to hit me and gets 10 (a miss). I risk a crew to attempt to sink her in return, rolling 3(+3). I'll use emergency help and raise that to an 8. We'll add the Huascar to the tonnage track and gain a crew. 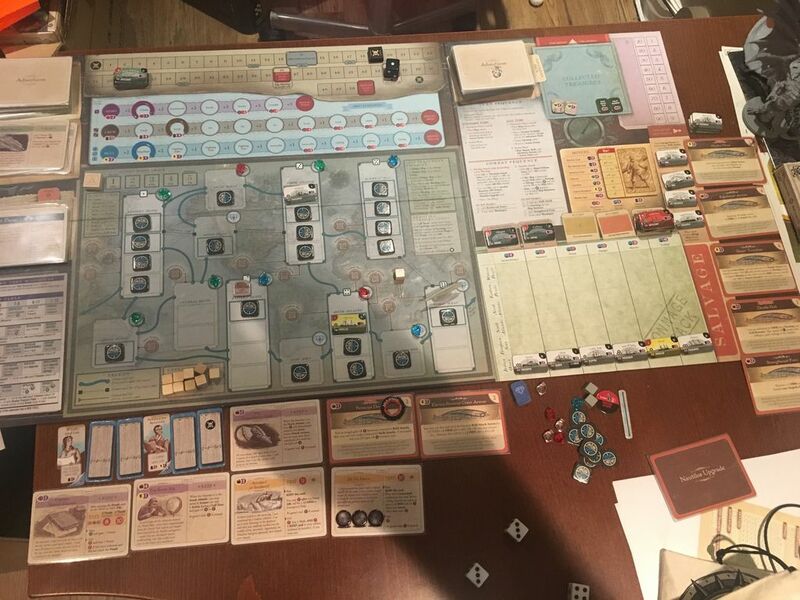 Free) Continued bold attack against a hidden ship in the South Atlantic. It's "La France", which, when turned over to its purple side is a quite mean at (12,10). No getting around this one. She attacks us first and rolls 2... number of hits is a d6 roll and it comes up 4. We roll the four hits and they are 4,4,5,6. All four on the Hull, which decreases to the not-so-surprising label "listing". We will attack her back, risking a Nemo and using a Cannonball (notoriety is now 41), because I can't really fail to take this one down - not just the 12 attack, but also, she's worth 10 VP. So here's the roll.... (drum roll please)…. 4(+6) and we just barely make it! (well, I had the Electro powered crew in reserve too). Anyways, she's added to tonnage. Notoriety goes to 42. Free) Last continued bold attack, this time against the "Donau"(-,8) and we'll be safe and risk a crew. The die roll is 4(+3), but we'll use the Electro Powered Crew ability and pump that up to the required 8 that we need to sink her. We'll add the ship to salvage. Free) I'll use "All by Electricity" and roll a 2 on a 1d3. 2 more actions added to the pool. 6) Search! We'll risk a crew for this search. The roll is 8(+2) and we are rewarded with the Sunken Treasure Fleet, as well as a treasure token. We draw a Wonder - the "Lost Mayan City". And so ends another productive turn. Time to get some incite cubes into the game to buy us more notoriety (time), and maybe also some rest and repair actions. Plus a refit action to grab reinforced armor for the battles to come. Event phase: "The Red Sea"(play). Well, I feel a bit ripped off, since I could have used this for the last serveral turns. Passing it is worth only 2 VP. But I only get 1 salvage for it (since max is 4). I'll do just that - adding a salvage. Placement - W:3,4,4 B:5 Oh.. the bad action rolls. Okay, it's time to take a lull turn. 2 hidden ships are added to the South Atlantic, and one is added to the North Atlantic. A treasure available is added to Cape Horn, as well as to the Adventure deck. The uprising cube in the Indian Ocean needs a 1 to stay and we roll a 1 (for posterity). 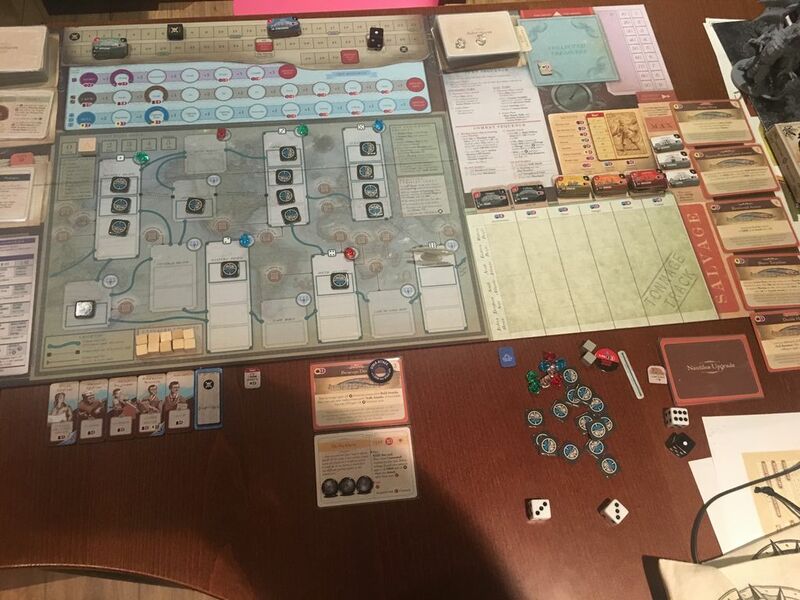 Free) Discard our First Officer to add 3 action points to the pool. Nemo decreases to "Unstable" again. 1) Go on an adventure. Hopefully the adventure card or the gems will help us. The adventure is "A Sacrifice to the Gods". An interesting card at an interesting time. I'll sacrifice a Crew to increase Nemo by 1, and raise notoriety to 43. We get two treasure tokens which are a 3 VP token and a 1 VP token. 2) We'll rest, using the 3 VP token, and risking a Nemo. The roll is 9(+6) and we gain 2 crew, who are now "Fresh". 3) I'll refit the Nautilus. Maybe if we get that reinforced armor, the Hull won't get hit as much, yes? Risk a Crew and a 1 VP gem. The roll is 8(+4) and we use up 3 salvage and grab the reinforced armor. And that's going to be all for tonight! With Notoriety being so high, I'd better get on that, I think! Correction: For week 14, action 3, I used an emergency help, but didn't remove it from the tableau. It was "Accident or Incident" which I'd passed earlier. I'll add that to the fail pile, and you'll see it's disappeared during the next update. Let's continue on, shall we? And see if we can salvage what is left of what has proven to be a very difficult game of Nemo's War. Event phase: "The Whales" (test 9). I think I can take a chance and risk both the Crew and Hull. It would mean I've have to roll a 5, but I have a +2 for help. The only thing that could go wrong is snake-eyes - which would lose me the game. 1 out of 36. Anyways, here we roll, risking crew and hull... we get a 6(+4) and pass. We can take a crew or 2 treasure tokens. I think I will actually take the treasure tokens, as these tend to have a lot of utility, and I'm just not sure I'll have time to do many searches in the turns to come. First token is a retain for +1 Crew! My decision is looking good so far! Second token is a +4 VP chit. Always nice. Placement - W:1,2,6 B:4 Oh yeah, this is the kind of roll I've been waiting for! Adding a hidden ship to the Western Pacific, the Central Pacific and the South Atlantic. I also draw the purple side of the Konig Wilhelm and decide to leave it in the Indian Ocean. Action points climb from zero to 5! 2) Perform an incite action. 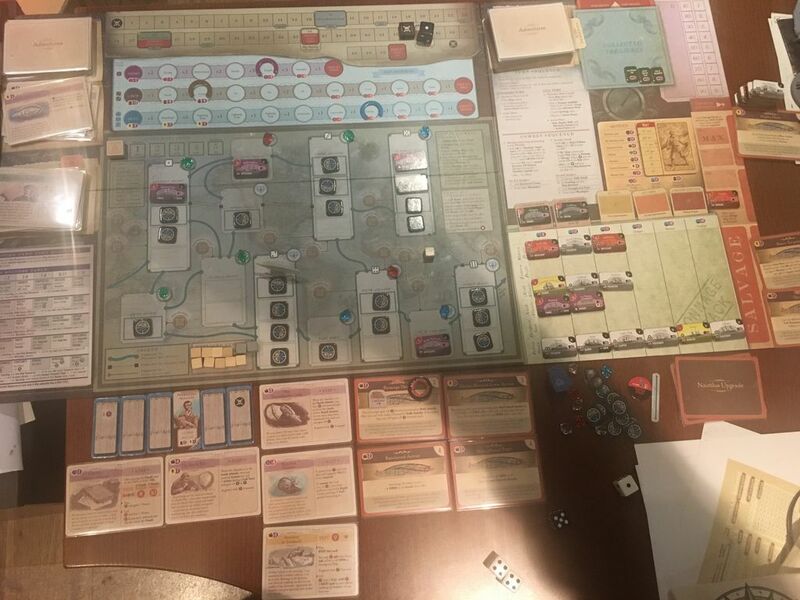 We'll risk a crew and roll 7(+5) and notoriety decreases to 41 and an uprising cube is placed in the Central Pacific. 3) Move to the Western Pacific. 4) Bold attack versus the "Shenandoah"(6,8). The Shenandoah rolls 4(+1). We'll use our Electro-Powered Crew to increase that by one more to 6, so that we take no damage. 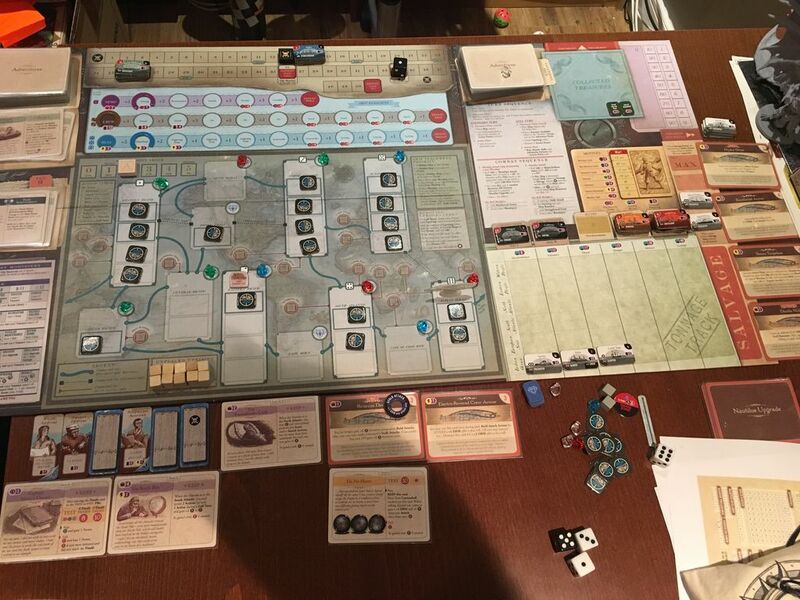 We attack back, risking a crew and roll 4(+4), passing both rolls by the skin of our teeth! We'll add the ship to tonnage, and it nets us an additional crew. Free) Continue the bold attack against a hidden ship. Oh, lucky me. We are up against the Ironside "Devastation"(11,12). It would have been easy on its red side, but we got the purple. She attacks first and rolls 5(+1), which is pretty far from the 11 we need. Because the dice show 1,4, we only take one hit. We roll 4 and it gets our hull. That's not good. Now we get to attack back. We'll risk a crew and see if we can take her down. The roll is 6(+4). To finish her off, we'd have to sacrifice Professor Aronnax, or the Electro-powered crew. I'll sacrifice Aronnax, but this has notoriety consequences, as you will see. Notoriety increases to 42 for sacrificing Aronnax. The ship is added to tonnage, but we add 2 more notoriety, taking us to 44. This adds the last black die to the placement pool. Free) Continue the bold attack against another hidden ship. We draw the "Sea Serpent and Baby"(12,10)… nice. This could spell the end. I think these were probably the 2 most powerful ships in the bag, to be honest. Okay. They roll against us first, and get 9(+1). That could be 3 hits, and our hull can only take 2, so I will reluctantly sacrifice the Electro Powered Crew Armor to add +2 to the roll. This means we take no hits. Now the critical part that would possibly make this worth it - killing the creatures. We will risk a crew, and roll 8(+4) and succeed! We add it to tonnage. Free) Continue to bold attack the last hidden ship. It can't be worse than those two, can it? So we draw the Armored Frigate "Jyland"(7,10). She rolls her attack and gets 4(+1). The dice say 1,3 so it hits once and rolls 2, reducing our crew. We risk a crew in our attack and roll 11(+4) and add the ship to tonnage. Notoriety increases to 45. 5) Last action will be an incite action. We'll risk a crew and roll 5(+5), which reduces notoriety to 44, and we add an uprising cube. Exciting turn? I thought so. We're almost dead, and I should probably fix that. Event phase: "The Lost Continent" (test 11). Well, not guts no glory. I'll risk a Nemo and a Crew for this. We roll 3. Hmmm... that reduces Nemo to Unstable for risking the resource, and then Defeat for failing the roll. I had no mitigation, sadly, so our journey is over. I'm wondering if I can use the fail effect of this to remove "Required Repairs" - I'm thinking that's probably a legal move? What if it was your only keep card? Hmm.. RESULT: DEFEAT!! Nemo is BROKEN! I think I'll tally up a "mock score" to see how I was doing. The Big Total was 90. Nope, not good. Do you think I could have turned it around? So, what's next? Another session will be started soon. I think you will enjoy it, because it is going to be VERY Special! Wow...did you get pounded -- the random luck factors just never "cooperated". You could have saved yourself by sacrificing an Upgrade (in lieu of that fatal Nemo loss), but your game would have remained very difficult. Your (ultimately futile) use of Electro-Crew Armor for +1 DRM, AND the sacrificial +2 DRM, during the same Bold Attack action was intriguing. Clearly you can't enjoy the +1 DRM more than once per Bold Action, but you may be right that the "expensive" +2 DRM option is available after the +1 was just used. There might be a question on this topic in the FAQ -- I can't remember...and its too late now to "make a Search roll". Yes, "Required Repairs" CAN be "dumped" as the "price" for Failing "The Lost Continent" -- regardless of the presence of other "Keep cards". The earlier +1 on the same roll against the sea serpent is from Reinforced Armor, so I think we’re good. edit: Unless you're referring to the previous attack against the Shenandoah, where I used the powered armor... in which case, I interpret each attack as a separate bold attack action, but costing 0 action points and 1 notoriety. This might be open to interpretation. We may need Alan to "solve" this one. I always interpreted "You may use this card once during each Bold Attack Action" as referring to each attack derived from a single Bold Attack Action being spent. My "clues" being that it wasn't plainly ...each Bold Attack, or ...each Bold Attack engagement", or even ...each Bold Attack action" (action here being smaller case and not "Bolded"). Of course maybe I am reading to much into that capitalized and bolded Action...I have been wrong before. Edit: Well I dusted off my rulebook and found the answer in a second (I guess I am also getting infected with "not looking at rulebooks" bug). Page 20 describes Electro-Crew Armor can only be used once in the series of Bold Attacks derived from one Action Point...and the +2 Sacrifice can't be used in the same "series" as when the +1 is used. As usual, you come through. I was fixated on trying to find the answer to that in the attack section on 23. Well, now I know for the future. I'm still impressed with this upgrade, I think. Its only limitation is thta it requires bold actions to use. However, it and reinforced armor are the only ways to give a bonus to a warship attack, and that's something. Plus it costs only 3 vs 4 for some of the bigger combat upgrades.